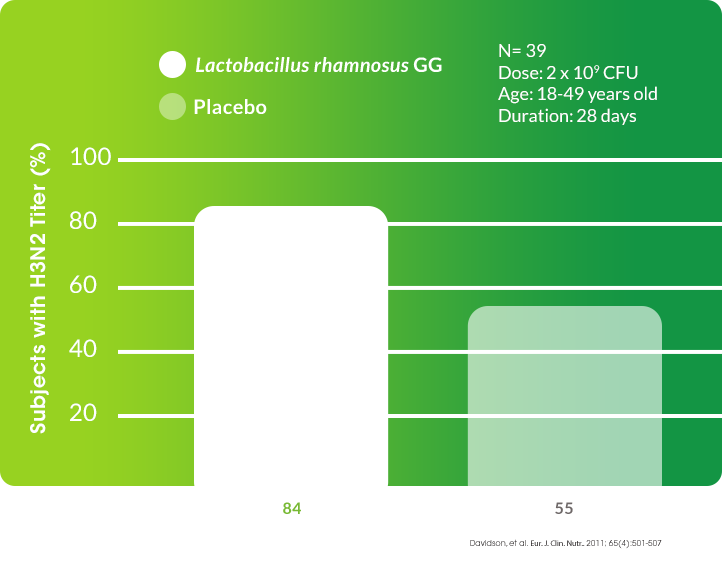 Lactobacillus GG supplementation’s support of natural defenses and overall health has been demonstrated in dozens of clinical trials involving thousands of healthy participants. 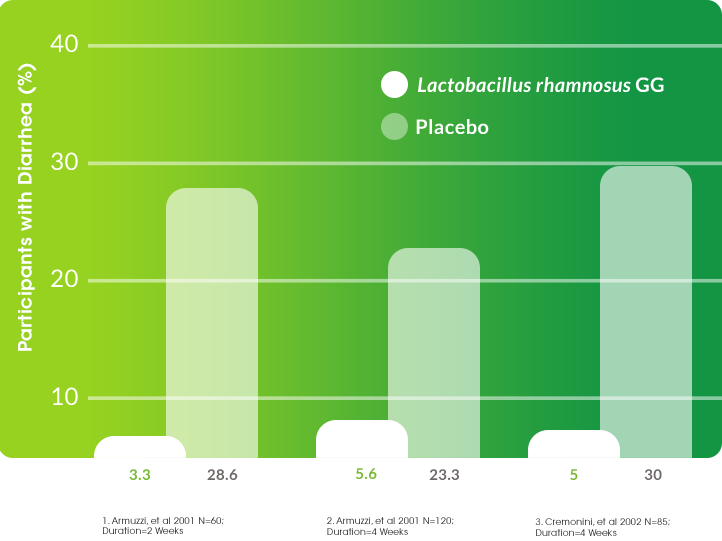 From promoting upper respiratory health to improving a patient’s response to the influenza vaccine, to helping to modulate allergic responses, the benefits of Lactobacillus GG have been linked to a battery of positive outcomes. Hypersensitivity reactions, or allergies, occur within minutes of exposure to a challenging antigen. Serious systemic reactions, or anaphylaxis, can be life threatening. 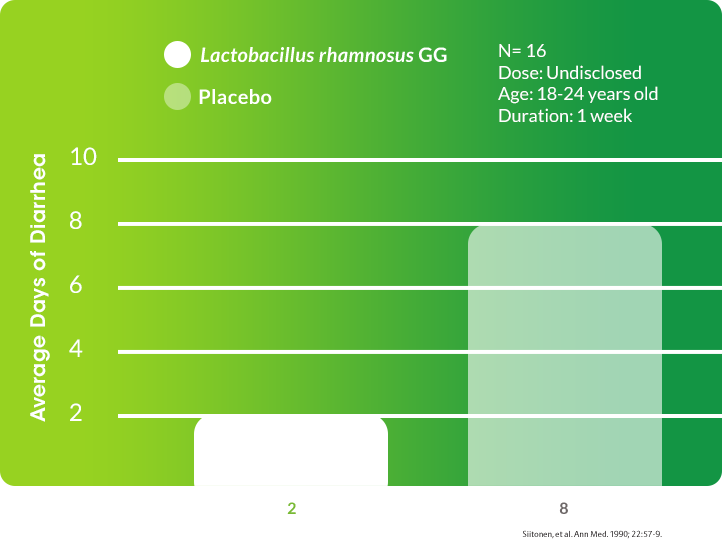 Studies indicate Lactobacillus GG has an immunostimulating effect on the oral mucosa, which can positively modulate a patient’s immune response. 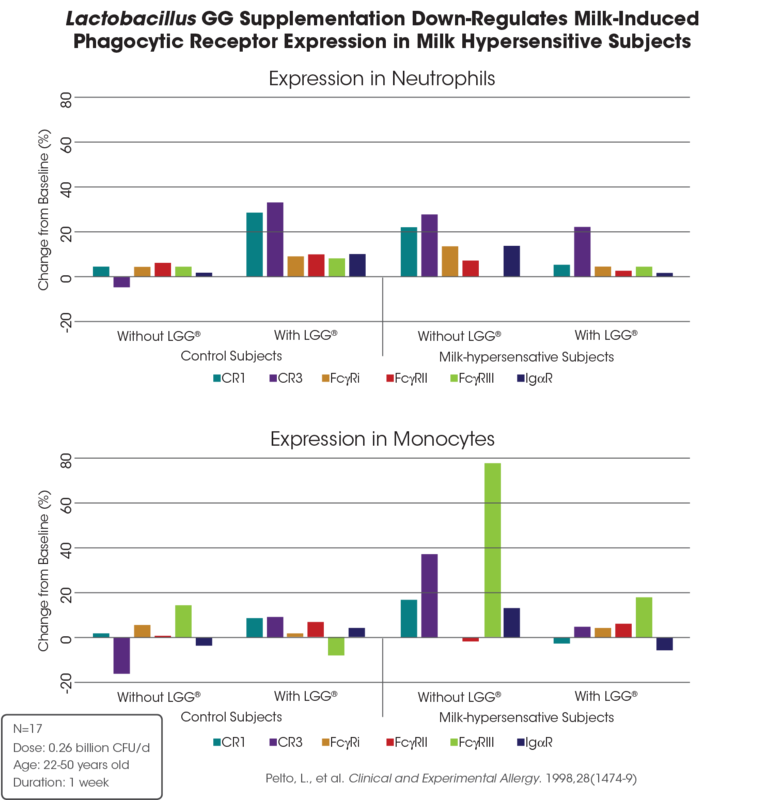 The expression of phagocytic receptors on neutrophils and monocytes was compared prior to and after a milk challenge. While milk significantly increased the expression of certain phagocytic receptors in milk-hypersensitive individuals, the addition of Lactobacillus GG attenuated this increased and ultimately the inflammatory response.24 However, Lactobacillus GG had the opposite effect in healthy participants where the phagocytic progress increased and receptor expression was up-regulated. Gogineni VK, Lee E Morrow and Mark,A.Malesker. Probiotics: Mechanisms of action and clinical application. Journal of Probiotics & Health. 2013(1):1-11. Segers ME, Lebeer S. Towards a better understanding of Lactobacillus rhamnosus GG - host interactions. Microbial Cell Factories. 2014;13(Suppl 1):S7-S23. Davidson LE, Fiorino AM, Snydman DR, Hibberd PL. Lactobacillus GG as an immune adjuvant for live-attenuated influenza vaccine in healthy adults: a randomized double-blind placebo-controlled trial. Eur J Clin Nutr. 2011;65(4):501-507. Siitonen S, Vapaatalo H, Salminen S, et al. Effect of Lactobacillus GG yoghurt in prevention of antibiotic associated diarrhoea. Ann Med. 1990;22(1):57-59. Vanderhoof JA, Whitney DB, Antonson DL, et al. Lactobacillus GG in the prevention of antibiotic-associated diarrhea in children. J Pediatr. 1999;135:564-568. Kalliomäki M, Salminen S, Poussa T, Arvilommi H, Isolauri E. Probiotics during the first 7 years of life: a cumulative risk reduction of eczema in a randomized, placebo-controlled trial. J Allergy Clin Immunol. 2007;119(4):1019-1021. Berni Canani R, Nocerino R, Terrin G, et al. Effect of Lactobacillus GG on tolerance acquisition in infants with cow's milk allergy: a randomized trial. J Allergy Clin Immunol. 2012;129(2):580-602. Salminen MK, Tynkkynen S, Rautelin H, et al. Lactobacillus bacteremia during a rapid increase in probiotic use of lactobacillus rhamnosus GG in finland. Clin Infect Dis. 2002;35(10):1155-1160. Luoto R, Laitinen K, Nermes M, Isolauri E. Impact of maternal probiotic-supplemented dietary counselling on pregnancy outcome and prenatal and postnatal growth: A double-blind, placebo-controlled study. Br J Nutr. 2010;103(12):1792-1799. Salminen MK, Tynkkynen S, Rautelin H, et al. The efficacy and safety of probiotic lactobacillus rhamnosus GG on prolonged, noninfectious diarrhea in HIV patients on antiretroviral therapy: A randomized, placebo-controlled, crossover study. HIV Clin Trials. 2004;5(4):183-191. Hilton E, Kolakowski P, Singer C, Smith M. Efficacy of Lactobacillus GG as a diarrheal preventive in travelers. J Travel Med. 1997;4(1):41-43. Oksanen PJ, Salminen S, Saxelin M, et al. Prevention of Travellers’ diarrhoea by lactobacillus GG. Ann Med. 1990;22(1):53-56. Armuzzi A, Cremonini F, Ojetti V, et al. Effect of lactobacillus GG supplementation on antibiotic-associated gastrointestinal side effects during helicobacter pylori eradication therapy: A pilot study. Digestion.2001;63(1):1-7. Armuzzi A, Cremonini F, Bartolozzi F, et al. The effect of oral administration of lactobacillus GG on antibiotic-associated gastrointestinal side-effects during helicobacter pylori eradication therapy. Aliment Pharmacol Ther. 2001;15(2):163-169. Cremonini F, Di Caro S, Covino M, et al. Effect of different probiotic preparations on anti-helicobacter pylori therapy-related side effects: A parallel group, triple blind, placebo-controlled study. Am J Gastroenterol. 2002;97(11):2744-2749. Cremonini F, Di Caro S, Santarelli L, et al. Probiotics in antibiotic-associated diarrhoea. Dig Liver Dis. 2002;34(SUPPL. 2):S78-S80. Videlock EJ, Cremonini F. Meta-analysis: Probiotics in antibiotic-associated diarrhoea. Aliment Pharmacol Ther. 2012;35(12):1355-1369. Rodgers B, Kirley K, Mounsey A. PURLs: Prescribing an antibiotic? pair it with probiotics. J Fam Pract. 2013;62(3):148-150. McFarland LV. Use of probiotics to correct dysbiosis of normal microbiota following disease or disruptive events: A systematic review. BMJ Open. 2014;4(8):e005047-2014-005047. Jernberg C, Lofmark S, Edlund C, Jansson JK. 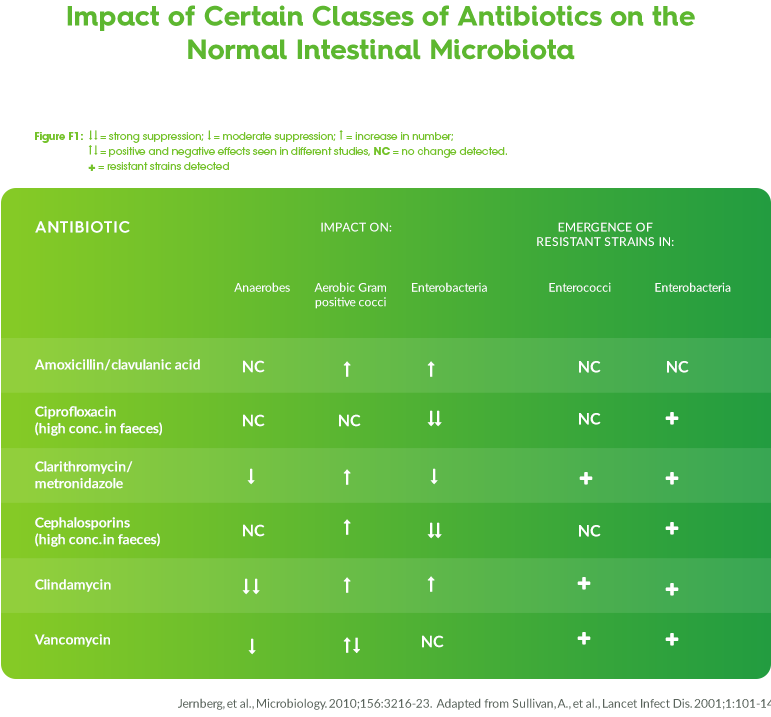 Long-term impacts of antibiotic exposure on the human intestinal microbiota. Microbiology. 2010;156(Pt 11):3216-3223. Panda S, El khader I, Casellas F, et al. Short-term effect of antibiotics on human gut microbiota. PLoS One. 2014;9(4):e95476. Kekkonen R, Lummela N, Karjalainen H, Latvlal S, Tynkkynen S, Jarvenpaa S, Kautiainen H, Julkunen I, Vapaatalo H, Korpela R. Probiotic intervention has strain-specific anti-inflammatory effects in healthy adults. World Gastroenterol. 2008;14(13):2029-36. Pelto L, Isolauri E, Lillus E, Nuutila J, Salminen S. Probiotic bacteria down-regulate the milk-induced inflammatory response in milk-hypersensitive subjects but have an immunostimulatory effect in healthy subjects. Clin Exp Allergy. 1998;28(12):1474-1479.